Okay, first up we need to chat…. the Kentucky Derby is May 2nd. That’s about 2 weeks away. It’s a HUGE deal here. The stores are all stocked with Derby Day party items, you find hats and fascinations all over the mall, and Derby talk pretty much dominates every tv broadcast. 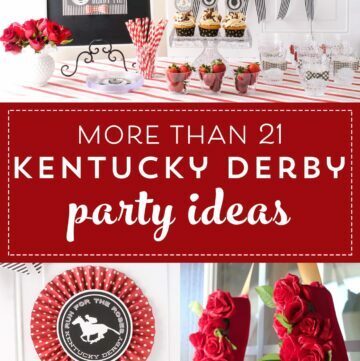 The next couple of weeks you’re going to see a lot of Kentucky Derby party and craft ideas shared here. Now I know what you’re thinking… what if I don’t care about the Derby? Well, you’re forgiven *wink* and… just know all of the ideas that I’m going to share are pretty general, you can easily adapt them for other holidays or occasions. I’ll be sharing a few ideas for my Derby Style fabric too, a few that are great for Derby and a few that are fun for just about anything. Yesterday I had the opportunity to try something new. I had my first tv appearance (unless you count the time when I was a kid and our school was on tv). 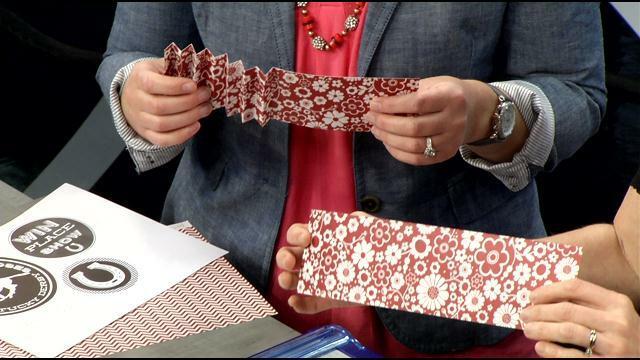 I appeared on WDRB to share a few ideas for using Paper Prize Ribbons in your Derby Decor. You can watch the video by clicking here. I walk you through step by step how to create the prize ribbons. I did not throw up or pass out during the segment, which I consider an accomplishment, since I didn’t sleep much the night before. 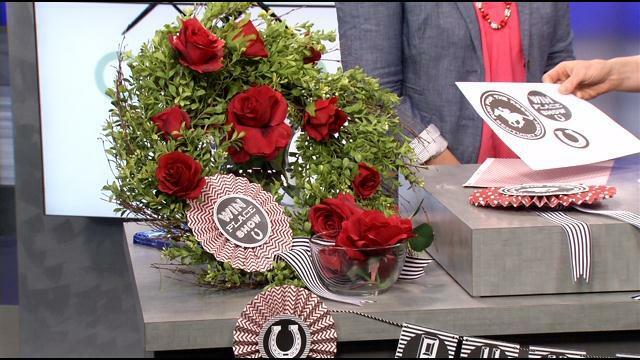 I’ll be back on WDRB again in May sharing some ideas for Mother’s Day – anyone have any requests or suggestions? As I mentioned yesterday the Prize Ribbons are really fun to create for other occasions too… you could make them to add to a teacher appreciation gift or a Mother’s Day gift. They also inspired my Prize Ribbons Quilt pattern, I guess you could say I’ve got them “on the brain” lately. 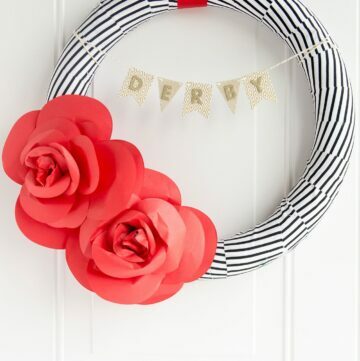 On the air yesterday I showed a Derby Wreath as one of the examples of ways to use the prize ribbons for Derby decor. Today I thought I’d share a few more photos of the wreath and tell you how I made it. 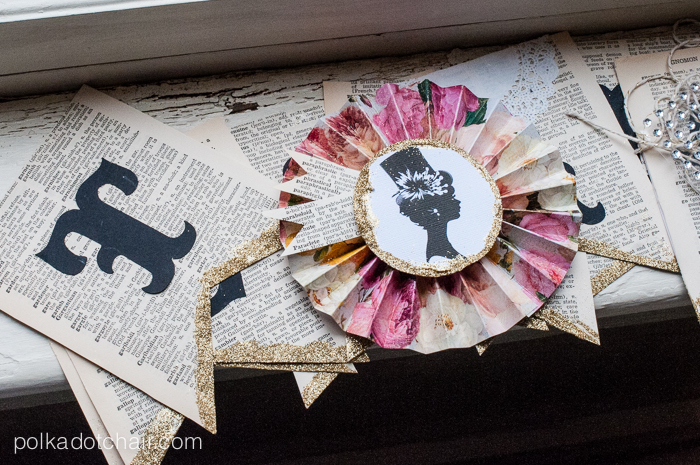 This wreath is crazy simple to make. I kept the design simple on purpose, but if you want you can easily add more embellishments to the wreath to make it fit your decor and personal style. 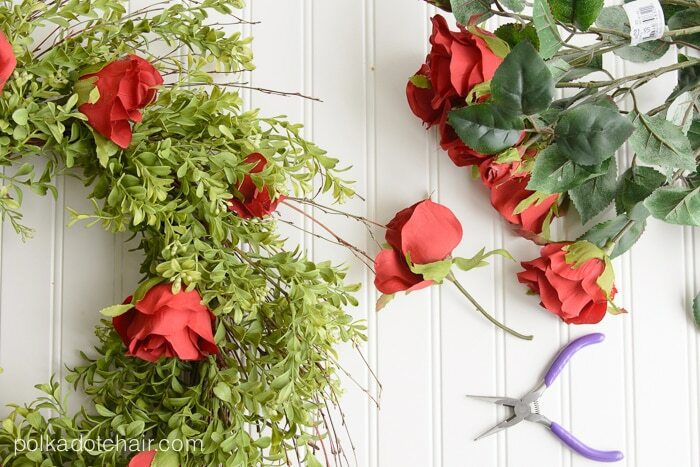 All you need is a purchased wreath form, a bunch of red roses, wire cutters, glue gun and floral wire and ribbon. It’s made by using 2 strips of paper that are each 12″ x 3″. 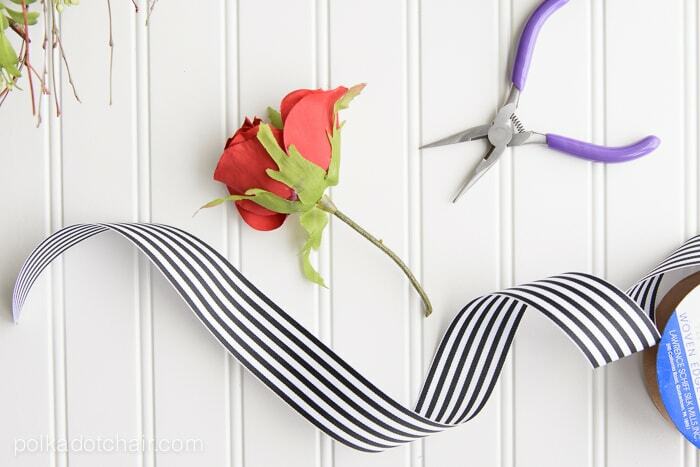 The center of the ribbon is on the printables link at the bottom of this page (you can follow this tutorial or watch the video to make the rosette). 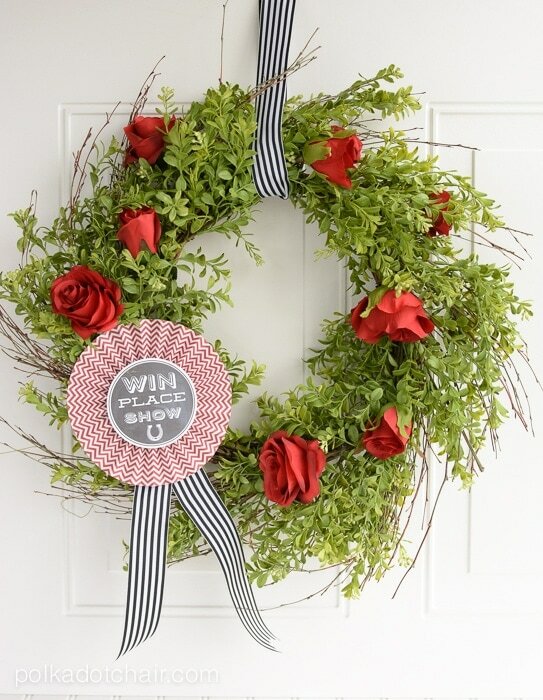 After the prize ribbon is made, wire it to the wreath form with some floral wire. (you can punch holes in the back of the ribbon if you need somewhere to run the wire through). 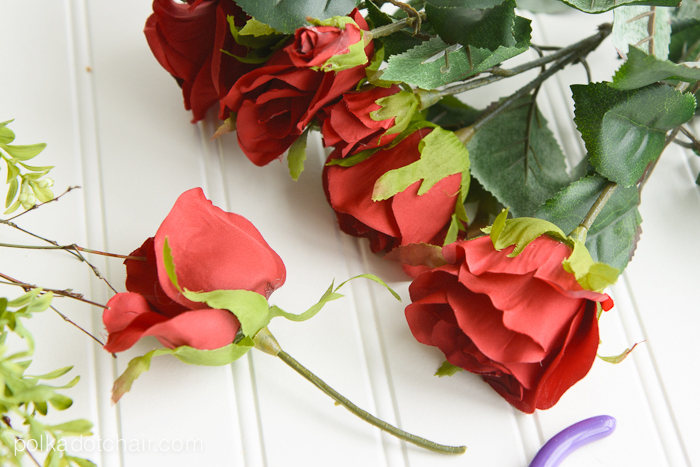 Use the wire cutters to remove the roses from the bunch. Then just hot glue onto the wreath. You can add as few or as many as you like. Lastly, cut a piece of ribbon and string it around the top of the wreath. Tie a slip knot in the ribbon and use this to hang the ribbon on the door. 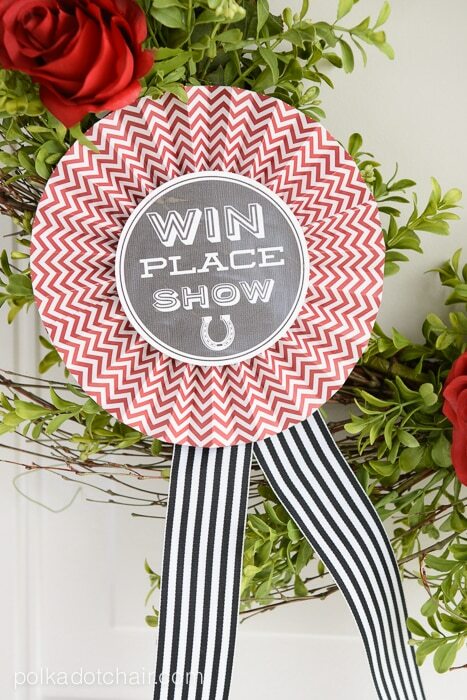 What a beautiful wreath & great way to use & display the prize ribbon !!! I love it! I am a Lexington girl and now that I am in Georgia I definitely miss all the Derby festivities! I absolutely love the races. Every spring it is so exciting when racetrack opens and everyone dresses up for a beautiful day when the sun finally comes out. I have been totally obsessed with your new fabric line (a horse girl here – my dad was a jockey) and have several projects I will be sharing in the next few weeks. I can’t say enough how happy this line makes me! Thanks for the beautiful inspiration. Shelly! I saw your projects!!! They are amazing!!!!! I’m out of town right now with limitied wifi, I’m going to make sure I pin and share them when I get home. 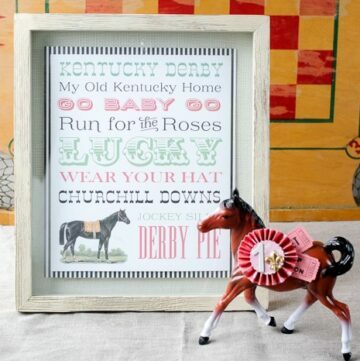 Have an awesome Derby week! !